Embracing its leadership role in sustainable tourism operations, El Nido Resorts ensures that they protect the rich biodiversity and maintain the natural beauty of the place they operate in. The island resorts not only enhance tourist experience with low-impact activities and sustainable menus, but also with guided tours complete with nature interpretation. 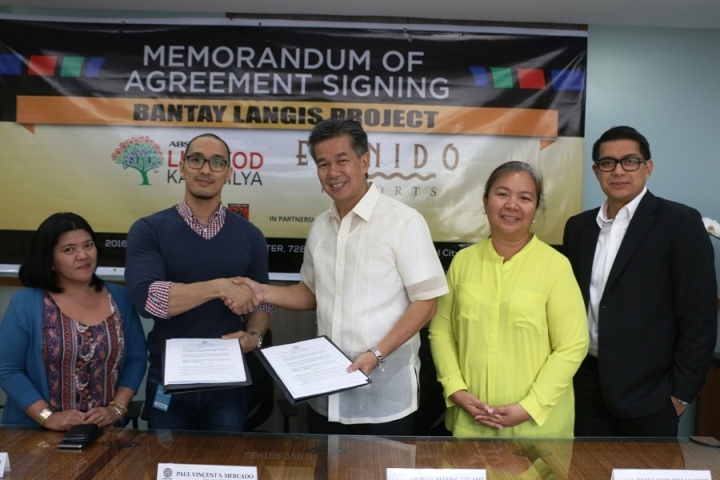 To strengthen its commitment in protecting and conserving the environment, El Nido Resorts partnered with ABS-CBN LingkodKapamilya Foundation – Bantay Kalikasan’s Bantay Langis Project last March 4, 2016. BantayLangis project is part of the hazardous waste collection activity of BantayKalikasan that aims to collect used industrial and cooking oils, through donation, for proper transfer, recycling and disposal. In partnership with Genetron International Marketing, a DENR-EMB accredited transporter and treater, the project advocatesproper recycling of hazardous used oils to prevent it from polluting the environment. The monetary value of the donated used oils will be used by BantayKalikasan for its eco-tourism projects to provide an alternative source of livelihood to the communities it supports. The memorandum of agreement signing was graced by Mr. Michael Alexis C. Legaspi – President & CEO - Ten Knots Development Corp, Ms. Mariglo I. Laririt – Director for Sustainability, Ten Knots Development Corp., and Mr. Paul Vincent Mercado – Chief Marketing Officer of ABS-CBN LingkodKapamilya Foundation, Inc.